I loved talking to Ken Liu on New Books in Science Fiction about two very different projects. One was his translation of Cixin Liu’s THE THREE-BODY PROBLEM and the other was his new (and first) novel THE GRACE OF KINGS. Below is my post describing the interview (my 17th!) on the New Books Network. Short story writing, novel writing, and translating require a variety of skills and strengths that are hardly ever found in a single person. Ken Liu is one of those rare individuals who has them all. He is perhaps best known for short stories like The Paper Menagerie, which (according to his Wikipedia entry) was the first work of fiction to earn Nebula, Hugo, and World Fantasy Awards. But this year he’s making waves with two longer projects, which are the focus of his New Books interview: his translation of Cixin Liu‘s The Three-Body Problem and his debut novel The Grace of Kings. The Three-Body Problem has been a break-out success in China for Cixin Liu, who has won China’s Galaxy Award for science fiction nine times. The Three-Body Problem is also the first hard science-fiction novel by an author from the People’s Republic of China to be translated into English. Ken Liu (who is not related to Cixin Liu) says sales numbers for science fiction in China would be the envy of American publishers, but Chinese publishers have traditionally considered it a niche market. That is, until The Three-Body Problem and its two sequels came along. Officially, Chinese readers have bought about 400,000 copies of the three-volume series but Liu says the actual number of readers is far larger as books get passed among friends and family. Liu anticipated it would be difficult to translate the language of science, but the cultural references proved more challenging. Ultimately, he decided to add concise footnotes to fill in some gaps without overwhelming readers with too much information. The success of his translation is reflected in the The Three-Body Problem‘s Nebula and Hugo nominations for best novel. 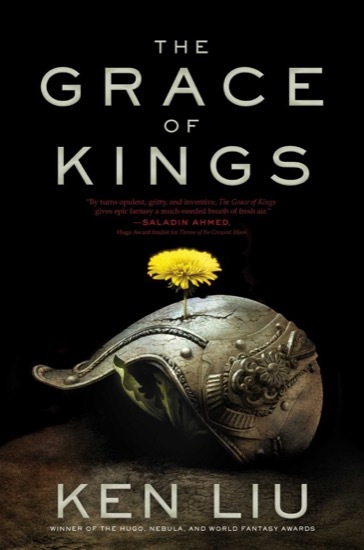 The Grace of Kings, the first book in Liu’s projected Dandelion Dynasty, is a very different project–an epic fantasy/science-fiction mashup that Liu calls “silkpunk.” Liu grew up in a Chinese speaking household. “Every culture has its own set of foundational narratives that are echoed and dialogued with and re-imagined over and over again… They’re stories about how a people embody their own values and see themselves as having meaning in the universe.” In the case of The Grace of Kings, Liu drew from an ancient historical struggle known as the Chu-Han Contention but reimagines it in a secondary world, using both classic Western and Chinese storytelling techniques.